Enchanted Excurse: Watercolor For Life! Hello Loverlies! 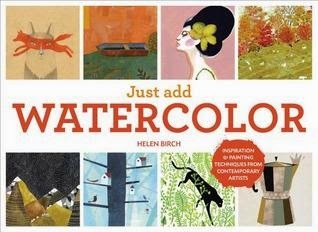 Just Add Watercolor by Helen Birch is an awesome little book. When I say little I mean how small the size is, and not that there isn't enough pages to read/look through. This book fits great on any end table/bedside table/coffee table, so that you can just grab it and look at the pictures any chance you get. There are plenty of paintings in this book to help give you inspiration and show you different ways of painting. The types of paintings that are shown in this book are Traditional Watercolor, Gouache, Digital, Mixed Media, Other-Water Based Media, and Non Paper Media. On each page there is information and tips about the painting that is on that page. I love how they have tips in this book, it will help me know more of what I can do whilst painting. It is a great book to own if you are a painter or even if you like learning about it. If you are interested in purchasing this book click HERE. Have a Blessed Day! About The Author: Helen Birch is a journalist and prolific artist based in the UK. She is also the author of the highly popular blog DrawDrawDraw reaching more than half a million readers. Birch teaches courses in art and design, fine art, and illustration at Bradford College, UK.